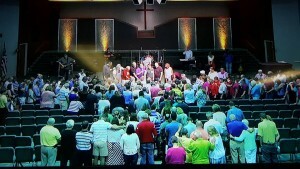 In this photo taken from a video monitor, the congregation of Grace Church, Delaware, Ohio, sends off Gary and Jennie Underwood to a new ministry in Akron, Ohio. Sunday was the last time that Gary Underwood led services at Grace Church in Delaware, Ohio, where he has served as senior pastor for nearly 12 years. In mid-July, he begins as campus pastor at the newly-organized Grace Church, Ellet Campus, in Akron, Ohio. The campus is a merging of ministries at Grace Church, Bath Campus (Jeff Bogue, senior pastor), and the Ellet Grace Brethren Church. Jonathon Carey, former pastor at the Ellet church, has transitioned to a staff position with Grace Church, Bath Campus.